Trichomes, the hair-like projections on plant leaves, have been well studied as an herbivore defense. However, whether variation in trichome type can have negative effects through the different stages of caterpillar life cycle is poorly understood. 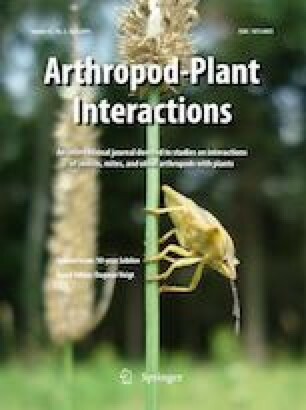 Using Solanum elaeagnifolium that produce non-glandular stellate trichomes, and Solanum lycopersicum that predominantly produce glandular, non-branched trichomes, we examined how trichomes affect choice and growth of Manduca sexta, a specialist herbivore of plant species belonging to the Solanaceae. To accomplish this, we removed leaf trichomes and added them into artificial diet for caterpillars, and allowed the caterpillars to grow and develop. Our results show that trichomes negatively affected caterpillar body mass and mass gain, although there was no preference or aversion for them in choice assays. Non-glandular trichomes were particularly damaging, as the consumption of non-glandular trichomes resulted in suppressed mass gain and increased time to pupation. While the consumption of glandular trichomes also affected growth, the effects were significantly lower compared to the consumption of non-glandular ones. Taken together, our results show that feeding on solanaceous trichomes can have negative effects on herbivore larval growth and development, and should be examined further. The online version of this article ( https://doi.org/10.1007/s11829-019-09678-z) contains supplementary material, which is available to authorized users. Plants produce hair-like projections called trichomes, which are developed from plant epidermis and provide a suite of functions (Werker 2000). These include resistance against abiotic stressors such as UV damage, low temperatures, and the resistance against insect herbivores (Ehleringer 1984; Skaltsa et al. 1994; Choinski and Wise 1999; Agrawal et al. 2004; Benz and Martin 2006; Dalin et al. 2008). As an herbivore-resistance mechanism, trichomes can either delay and restrict herbivore movement, or act as appendages to deliver toxins that reduce herbivore feeding (Agren and Schemske 1993; Agrawal et al. 2004). In some plant species, trichomes are also thought to be specifically evolved in response to mammalian herbivory, such as the stinging hairs present in the plant families Urticaceae and Losaceae (Tuberville et al. 1996; Hurley 2000; Mustafa et al. 2018). While a huge diversity of trichomes is found across the plant kingdom, they can be mainly classified into glandular and non-glandular ones based on their structure and shape. For example, non-glandular trichomes can be tough and needle-shaped and can cause physical damage to insect herbivores, acting as a surface barrier delaying their access to epidermis, and in some cases, even physically entrapping insects (Dalin et al. 2008; Szyndler et al. 2013; Weigend et al. 2018). On the other hand, glandular trichomes are frequently more flexible, deliver toxic metabolites via their terminal glandular heads, and activate herbivore defense gene expression in plants (Peiffer et al. 2009). And, in some cases, these glandular trichomes also mediate multitrophic interactions between host plants, herbivores, and their natural enemies. For example, the O-acyl sugars ingested by caterpillars from the glandular trichomes can tag them to be easily located by their ant predators, as observed in the Nicotiana attenuata Torr. Ex. S. Watson (Solanaceae) Manduca sexta L. (Lepidoptera, Sphingidae) system (Weinhold and Baldwin 2011). And, more interestingly, in sticky plants such as sticky columbine (Aquilegia eximia Van Houtte ex Planch. ; Ranunculaceae) and tarweed (Madia elegans D.Don ex Lindl. ; Asteraceae) glandular trichomes have also been found to enhance indirect defenses by entrapping and kill small insects, that attract scaving predators and increase their abundancy in the habitat (Krimmel and Pearse 2012; Lopresti et al. 2015). In addition to their constitutive expression and functions, both trichome types have also been found to be inducible, mostly by insect herbivory. In several plant species and cultivars, this induction leads to increased number of trichomes on newly formed leaves (Baur et al. 1991; Dalin and Björkman 2003; Kariyat et al. 2013) suggesting both systemic and adaptive nature of trichome-mediated defenses. Most studies on trichome–herbivore interactions have either focused on their function on a specific growth stage of the herbivore or their altered mass gain, or a combination of both (Kariyat et al. 2013, 2017). A comprehensive understanding of whether the consumption of trichomes has effects on growth and development of herbivores, and whether these are trichome type-dependent is still unanswered. Recent work has also documented that the effects of trichomes are both trichome type (glandular vs, non-glandular)- and caterpillar instar (early vs. late)-dependent, and that only early instar feeding is affected by either trichome type when compared to late instars (Kariyat et al. 2018). In addition, for early instar caterpillars, non-glandular trichomes are more effective in restricting the insects, when compared to glandular trichomes (Kariyat et al. 2017, 2018). Even though most studies on trichome–herbivore interactions have focused on pre-ingestive caterpillar feeding restriction, recent work has also shown that, at least in the case of non-glandular trichomes, they can also cause post-ingestive effects on the herbivores. We recently documented that the non-glandular stellate trichomes from Solanum carolinense L. (Solanaceae) caused massive tears on M. sexta peritrophic matrix (Kariyat et al. 2017), which is the protective layer of insect digestive tract (Pechan et al. 2002). The caterpillars were unable to digest the trichomes and these trichomes were also found to be embedded in their frass pellets (Kariyat et al. 2017). Interestingly, early instar caterpillars did not have such damage, and they tended to avoid trichomes and actively searched and commenced feeding on a low-trichome or trichome-free area of the leaves. And, while trichomes were unable to delay or restrict late instar feeding and leaf ingestion, tears of peritrophic matrix was observed more on late instars than on early instars, because of their continuous ingestion of trichomes along with leaf material (Kariyat et al. 2017, 2018). It is possible that in addition to affect their feeding efficiency these differences can also potentially prolong their growth stages, thereby having longer exposure time to potential predators (Kariyat et al. 2017). Furthermore, the altered body odor profile post ingestion of glandular trichomes has been found to be one of the mechanisms by which caterpillars become easier to be detected by predators (Weinhold and Baldwin 2011). The post-ingestive effects of non-glandular trichomes on caterpillar gut also suggest that ingesting trichomes could possibly lead into development defects, especially since ruptured peritrophic matrix can cause immune response, slowing down growth (Kuraishi et al. 2011). In addition, continuous exposure to the toxic metabolites from glandular trichomes can lead into developmental effects in herbivores (Walters et al. 1989; Steiner et al. 2015). However, it is challenging to specifically address the effects of trichomes, disentangled from other confounding defenses (both chemical and structural) in plants that also act in concert. For example, trichome production is under the plant hormone jasmonic acid pathway-mediated by CORONATINE-INSENSITIVE1 (COI1), an F-box protein (Liu et al. 2004), but the pathway also affects a multitude of other physiological functions in plants. We approached this question using a series of behavioral and growth assays. 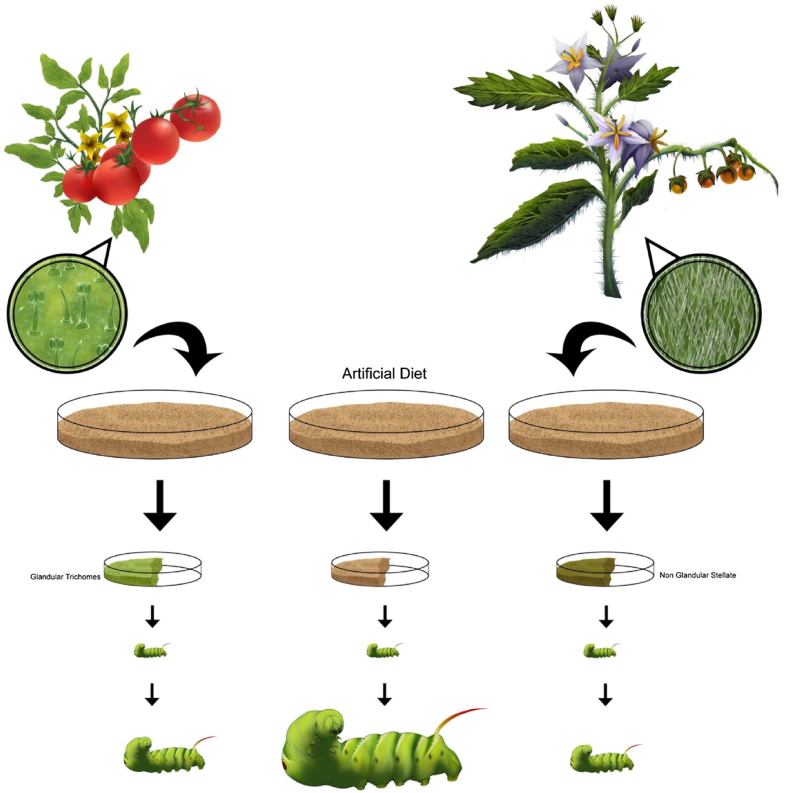 Specifically, we grew M. sexta caterpillars on an artificial caterpillar diet mixed with trichomes removed from the leaves of Solanum lycopersicon (predominantly covered with glandular, capitate trichomes) and Solanum elaeagnifolium (exclusively covered with non-glandular stellate trichome, of which spikes are conically tapered; Burrows et al. 2013) and their choice, growth and developmental milestones. We hypothesized that artificial diet mixed with glandular trichomes would be detrimental to M. sexta caterpillars of early instars due to its toxicity, and non-glandular trichomes during late instars because of their ability to affect digestion and possible immune response. Solanum elaeagnifolium is a weedy perennial native to southwestern US and Mexico. Both abaxial and adaxial leaf surfaces of this species are densely covered with non-glandular stellate trichomes (Burrows et al. 2013; Kariyat and Chavana 2018) and M. sexta caterpillars successfully grow and develop on the species. The plants used for the removal of trichomes were derived from three native populations of the species in south Texas, USA from two cities—Edinburg, and McAllen (Kariyat and Chavana 2018). Circa 100 plants were collected and pooled from three populations, and were brought to the lab, where they have been growing for more than a year, and any changes in morphology or abundancy of trichomes on leaf surfaces have been observed unless herbivory was introduced. Mature, fully opened leaves were collected from the apices of these plants (4–5 leaves per each) and used for trichome removal. We used store-bought (Walmart, Inc., Edinburg, Texas, USA) seeds of the tomato variety ‘Early girl hybrid’ and planted them in flat trays (51 × 25 cm, Kenney Bonded Warehouse, Donna, TX, USA) with potting soil (Berger Custom Blend, Kenney Bonded Warehouse, Donna, TX, USA). Ten days after germination, seedlings were transplanted into 8ʺ plastic pots and kept in a growth chamber at 26 °C temperature, ~ 50% relative humidity, and 16:8 light dark cycle, and watered regularly. We grew approximately 125 plants, and once the plants produced more than five fully expanded leaves, these leaves, were pooled for trichome removal. Manduca sexta eggs were purchased from the company Great Lakes Hornworms (Romeo, MI, USA) and were allowed to hatch in a Petri dish (8.8 cm diameter, Mid Sci, MI, USA) equipped with a moist paper towel and placed in an incubator under the following conditions: 27 °C temperature, 60% relative humidity, and 16:8 day night cycle. Once the eggs started to turn pale green (from dark green), they were carefully removed using a paintbrush and placed gently on the artificial diet pellet assigned for each treatment. Manduca sexta caterpillars were allowed to feed on a wheat germ-based artificial diet prepared as per recommendations from the supplier Great Lakes Hornworms. We boiled 1000 ml of water to 85 °C then added 250 g of artificial diet and mixed thoroughly until there were no more clumps. For non-glandular trichomes, we used a surgeon’ scalpel (No. 22, Carolina Biological, Burlington, NC, USA) to shave the trichomes from leaves. The leaves collected from plants were allowed to dry for 6–8 h, and the trichomes were carefully shaved off. Shaved trichomes were added to a beaker with de-ionized water and stored in 4 °C until artificial diet was prepared. After each leaf was shaved, they were examined (first under a dissecting microscope, and then visually) to confirm that almost all of the trichomes from both abaxial and adaxial sides were removed. Any leaf materials stuck to the trichomes were also carefully removed under the microscope (for details of the method see Kariyat et al. 2017). To remove glandular trichomes, we modified a method by Yerger et al. (1992) that allowed us to separate them from the plant leaves while keeping their structural integrity intact. Briefly, we collected leaves from apical tomato plants, and made samples with three leaves each placed into a Falcon tube (15 ml), and immediately stored them at − 80 °C for 24 h. The tubes were then removed from the freezer, and vortexed for 15–20 s allowing the intact trichomes to fall off of the leaves. To collect the trichomes that were stuck to the wall of the tube, each tube was rinsed with 5–7 ml of de-ionized water. Afterwards, the contents of the tube were filtered to remove leaf material. The filtered solution from all tubes were collected into a beaker. This solution was mixed with the artificial diet described above (Yerger et al. 1992). The experiment involved three treatments (see Fig. 1): (1) artificial diet mixed with shaved non-glandular trichomes, (2) artificial diet mixed with separated glandular trichomes, and (3) control, i.e. artificial diet without any added trichomes. To achieve this, we removed trichomes from 125 leaves for treatment (1) and 250 leaves for treatment (2). This was because we found that S. elaeagnifolium had about double the number of trichomes than tomato per leaf lamina, based on a preliminary study we carried out beforehand. The separated trichomes were added into 1000 ml of lab grade de-ionized water and vortexed for 10 s. Utmost care was taken to ensure that there was no leaf material present in the extracted trichomes. This water with the added trichomes was used to prepare artificial diets mixed with either glandular or non-glandular trichomes. The control diet did not have any added trichomes. All the three diets were then allowed to cool, storing them in a refrigerator at 4 °C. After 24 h, the diets were cut into ~ 1 cm3 cubes and placed on a moist paper towel corresponding to the diameter of the Petri dish (8.8 cm). The diet pellet and the towel were placed inside the Petri dish together with a single M. sexta egg ready to hatch (examined under microscope for movement of the live embryo) on top of the diet pellet. Petri dishes were placed in the lab bench on 16:8 day night cycle. A total of 33 M. sexta caterpillars each were randomly chosen for each of the three diet treatments. Two days after hatching (instar 1), the caterpillars were weighed with a microbalance (Accuris Instruments, DX series, USA) and placed back on fresh diet pellet. From then on, every 3 days the caterpillars were weighed, and placed back on fresh diet pellets. Since the caterpillars could be either on the pellet or away from them, data were also collected on their position in the Petri dish (on the pellet or off the pellet) every 3 days. The paper towel and frass were removed every 2 days, respectively every day during later stages, and the Petri dishes were cleaned 2–3 times a week. We monitored the larval stages and continued to take mass measurements until they reached the prepupal wandering stage. We conducted pairwise choice assays with second and third instar caterpillars to examine whether they preferred to feed on one treatment over other. For second instar caterpillars, we used clean plastic Petri dishes and placed a ~ 1-cm3 diet pellet of the respective treatment on the edges of the dish. A naïve newly molted and 2-h starved M. sexta was then placed on the opposite corner of the dish and was allowed to choose between the diet treatments. Any caterpillar that did not make a choice within 30 min was discarded. A total of 30, naive caterpillars were comparatively tested (each separately) including control versus non-glandular, control versus glandular, and glandular versus non-glandular. For third instar caterpillars, we followed a similar procedure with sample size and treatments, but they starved for 4 h, and instead of a Petri dish, a rectangular plastic container (40 × 15 x cm, Walmart, Inc., USA) was used. The diet pellets were separated by a distance of ~ 30 cm, and the caterpillar was placed in the middle and allowed to choose between the two treatments provided at a time. Any caterpillar that did not make a choice within 10 min was discarded and removed from the analysis. See Kariyat et al. (2014) for details of the methodology and schematics of the choice assays. Due to the non-normal nature of some of the data sets, we used a combination of non-parametric and parametric tests to analyze the data. One-way ANOVA and Kruskal–Wallis tests, followed by all pairwise combinations through post hoc tests Tukey and Dunn’s, respectively, were used to analyze the differences in mass and mass gain, mass at wandering, and time to reach wandering data among the three treatments. Separate analyses were carried out for each time points of caterpillar development considered for both mass and mass gain. Results from these analyses were also used to plot two separate growth curves with mass and mass gain. χ2 Tests were used to analyze choice of second and third instar caterpillar between two diet treatments, and the position of caterpillar (on/off diet) in the Petri dish during mass gain data collection monitoring larval development. All analyses and graphing were carried out with the statistical software GraphPad prism (La Jolla, California, USA). Our analysis of mean caterpillar mass over the complete larval stage of M. sexta showed significant differences between the three treatments (control 4.025 ± 0.307 g; non-glandular trichomes added 2.414 ± 0.253 g; glandular trichomes added 3.351 ± 0.281 g; Kruskal–Wallis test; Kruskal–Wallis statistic = 12.68; P = 0.0018; Fig. 2a). However, post hoc tests showed that these differences were significant only between non-glandular- and glandular trichomes-containing diets, and between the trichomeless control and non-glandular trichome-containing diet, and not between control and glandular trichome-containing diet (Fig. 2a). In addition, we ran separate body mass analyses on each time point (roughly corresponding to different instars) for six defined times during larval stage of the life cycle until they reached the wandering stage ready to pupate (refer to Fig. 2b–h). Among these measurements, we found that except for the initial mass at the start of the experiment, there were significant differences between the three diet treatments for all the time points of caterpillar development (Fig. 2b–h; Table 1). Post hoc tests also revealed that caterpillars grown on non-glandular trichome diet had significantly lower mass than the control and glandular trichomes diet on all mass measurements (Fig. 2). M. sexta reared on non-glandular trichomes diet also differed significantly from those reared on control, except that these differences were limited to three time points, corresponding to the second, third and fourth instars (Fig. 2d, f, g). Collectively, caterpillar mass data clearly shows the negative effects of trichome-containing diets when compared to control diet. To compare the difference in body mass between different caterpillar instars (time points) dependent on the impact of initial body mass and initial effects of diet treatments, we ran body mass gain analyses during the larval development of M. sexta. While the general trend of significant differences in mass gain sustained among the various time points, the impact on late instar caterpillars was much lower. 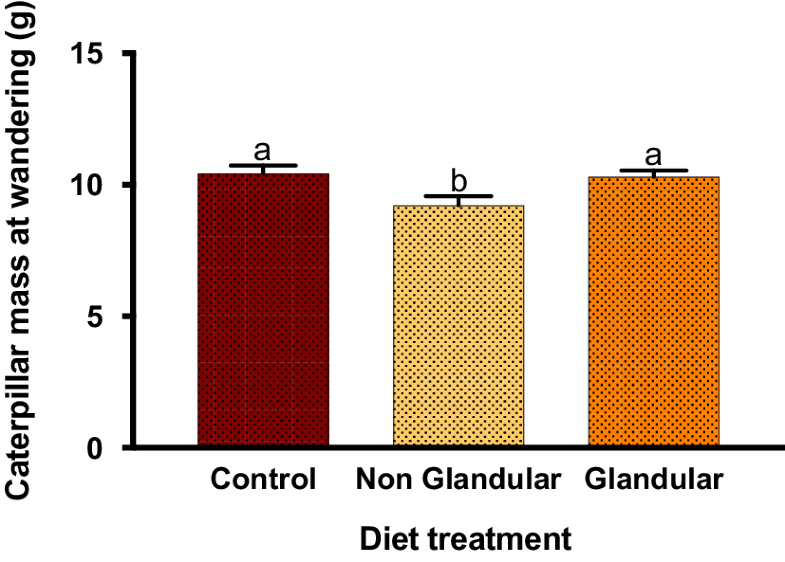 The mass gain analysis over the entire larval period of the caterpillars (total body mass gain = final body mass − first mass/initial body mass) showed significant differences among the diet treatments (control 2.975 ± 0.065; non-glandular 2.602 ± 0.063; glandular 2.776 ± 0.071; one-way ANOVA, F = 8.294, P = 0.0007, Fig. 3a). 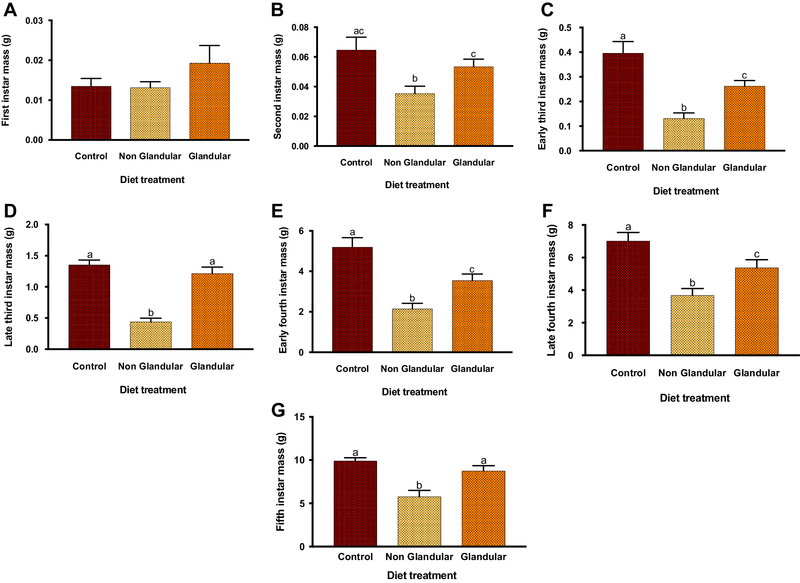 Surprisingly, we found that while the diet treatment effect was significant, there was no difference between control and diet mixed with glandular trichomes or between glandular and non-glandular trichome-containing diets according to pairwise post hoc comparisons. 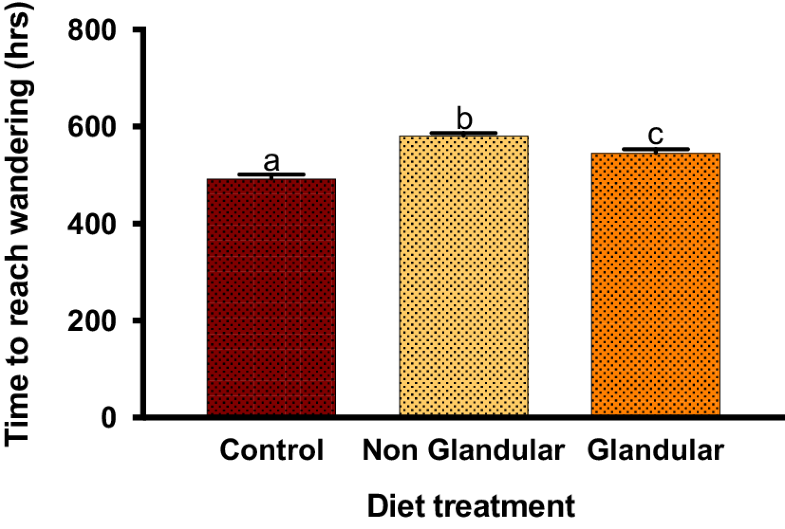 The only significant difference was between control and non-glandular trichome-containing diets, where caterpillars on non-glandular trichome-containing diets had lower body mass gain (Fig. 3a). In addition, we also tracked the body mass gain of the caterpillars at six more time intervals (various instars) until they stopped feeding and got ready to pupate. 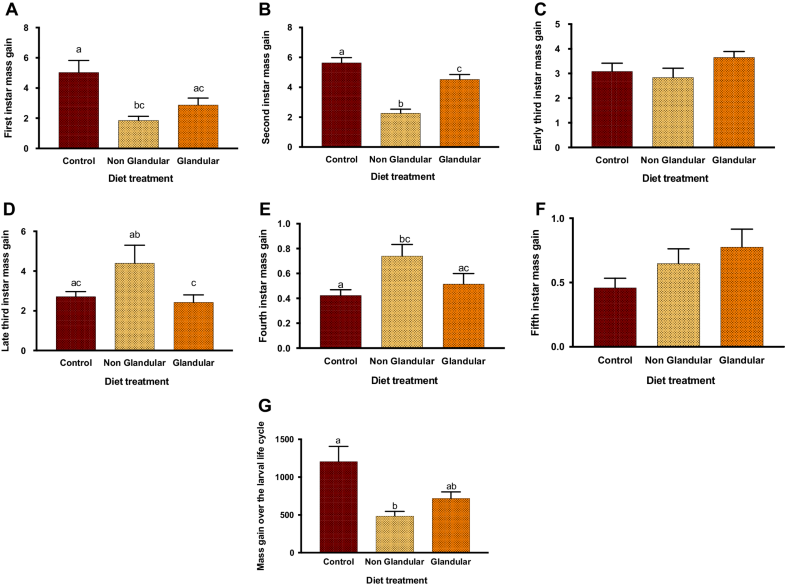 We found that only at the second instar the body mass gain significantly differed from each other in all the treatments (control 5.370 ± 0.343; non-glandular 2.268 ± 0.268; glandular trichomes 4.528 ± 0.323; one-way ANOVA, F = 28.22, P < 0.001; Fig. 3b–g; Table 2). During other time points of larval instars, the pairwise post hoc comparisons were mostly insignificant. Interestingly, we also found that during the later stages of their growth, the caterpillars on non-glandular trichome diet had higher body mass gain than on glandular trichome diet (late third instar; non-glandular trichomes 4.401 ± 0.901; glandular trichomes 2.426 ± 0.3759, Tukey test, P = 0.02, Fig. 3e) and control (fourth instar; control 0.4241 ± 0.0457; non-glandular trichomes 0.7405 ± 0.0923; Dunn’s test, P = 0.04, Fig. 3f) suggesting that there was compensatory feeding response by caterpillars on non-glandular trichomes diet against the cost incurred during their initial period of growth. The effects of trichome diets on caterpillar body mass and mass gain over the complete larval stages was even clearly visible in the growth curve plotted using the above-described analyses (Fig. 4a, b). The curves clearly show that while body mass differences among diet treatments were found for each larval instar, the most severe differences in body mass gain was observed during the early instars. To test whether the diet effects lingered towards the pupation stage of the caterpillars, we also ran an analysis on their body mass at prepupal wandering stage, when they stopped eating and were getting ready to burrow. We found that while the treatment effect was significant (one-way ANOVA, F = 5.533, P = 0.014, Fig. 5), the pairwise post hoc comparisons were significant only between control and non-glandular trichomes diet (control 10.44 ± 0.300 g; non-glandular trichomes 9.237 ± 0.336 g; Tukey test, P = 0.017), and non-glandular trichome- and glandular trichome-containing diets (non-glandular trichomes 9.237 ± 0.336 g, 10.30 ± 0.253 g, Tukey test, P = 0.047), suggesting that among the diets containing trichomes, only that mixed with glandular trichomes had a negative impact on caterpillar body mass at the time of wandering (Fig. 5). Our analysis on time to reach wandering stage (h) showed that the trichome-mixed diet had a significant effect on M. sexta larva (control 492.900 ± 7.789 h; non-glandular trichomes 581.600 ± 5.647 h; glandular trichomes 545.500 ± 8.530 h, Kruskal–Wallis test, H = 33.56, P < 0.0001, Fig. 6). More interestingly, the post hoc tests showed that all pairwise combinations were also statistically significant (control vs. non-glandular trichomes; Dunn’s test, P < 0.0001; control vs. glandular trichomes, Dunn’s test, P = 0.002, and non-glandular vs. glandular trichomes, Dunn’s test, P = 0.039) and that the caterpillars took significantly longer to reach the wandering stage—when reared on non-glandular trichome-containing diet, followed by glandular trichome-containing diet and control. 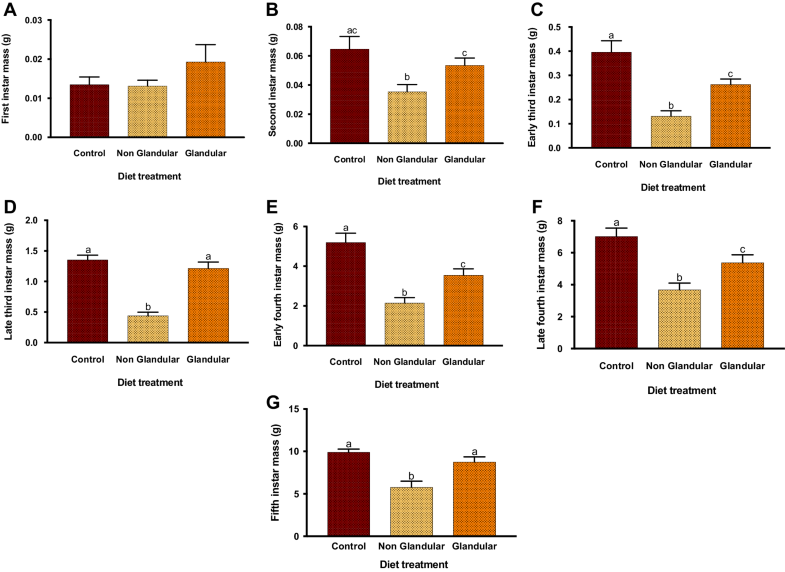 Likewise with the other data sets, this clearly shows that non glandular diet significantly slowed down caterpillar development and thereby prolonging the total larval stage. Our analyses on caterpillar feeding behavior revealed some interesting trends. Regardless of the diet treatment, early instar caterpillars stayed on the diet pellet. However, as they become bigger (late instars), although the Petri dish had ample space to move around, they tend to stay away from the diet pellet. Our χ2 analyses clearly showed that for all the three treatments, the caterpillars exhibited significant differences between early and late instars on whether they were on the diet pellet, or away from it at the time of observation (glandular trichome, χ2 = 13.2815, P = 0.00268; non-glandular trichome, χ2 = 4.9499, P = 0.02609, and control on vs. off, χ2 = 10.19, P = 0.001413, Fig. 7a–c). We pooled the first three observations as early instars, and the last four as final instars. It was also interesting to observe that this trend was consistent across all treatments, but not only on trichome-added diet, suggesting that this was more dependent on caterpillar mobility behavior rather than on their aversion towards either of the trichome treatments. 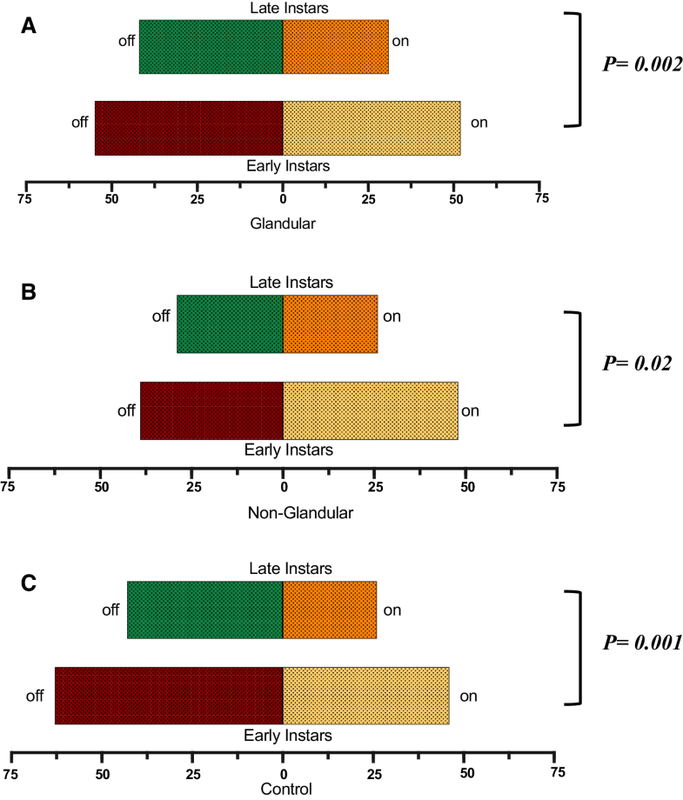 The χ2 analyses on caterpillar choice showed no clear preference between early (second) and late (third) instar caterpillars towards or against any particular diet treatments. All pairwise combinations for choice by early and late caterpillars were found to be insignificant (control vs. non-glandular trichomes, χ2 = 0.785, P = 0.375, control vs. glandular trichomes, χ2 = 1.776, P = 0.182, and non-glandular trichomes, χ2 = 0.6269, P = 0.428). The data shows that regardless of caterpillar age and larval stage, the trichomes mixed with the artificial diet did not elicit any attraction or repulsion behavior. Our results clearly demonstrate that trichome-containing diet can negatively affect caterpillar growth—evident and development. Trichomes, while mostly regarded as the first line of defense have always been considered one among the many defenses, not necessarily a major one (Howe and Jander 2008; Kariyat et al. 2013). Here, we show that once disassociated from other defenses, trichomes can still cause significant negative effects in caterpillar growth evident from their reduced body mass and mass gain over their larval development. Consequently, the caterpillars also took longer to reach pre-pupation wandering stage. The clear pattern of extended effects of trichomes on caterpillar growth also suggests that these effects could linger into pupal and adult stages of the species. Previous work on M. sexta using plants with variation in nutrition value and mode of defenses (inbred vs. outbred; S. carolinense) have shown that caterpillars reared on less defended and more nutritious (also with a lower number of trichomes per unit leaf area) inbred plants tend to be bigger and have more efficient flight muscles when compared with those reared on their outbred counterparts (Portman et al. 2015a, b). In addition, we also found that trichome-mediated growth effects are also trichome type-dependent, and non-glandular stellate trichomes from S. elaeagnifolium had a bigger effect on M. sexta larval growth parameters when compared to glandular, capitate trichomes from S. lycopersicon. Data on caterpillar body mass dependent on the diet treatments showed an interesting trend. Barring the non-significant initial mass between the treatments, at every other time point, the caterpillars had their lowest mass on non-glandular diet. While non-glandular trichomes have been shown to reduce herbivory in both natural and controlled environments (Agren and Schemske 1993; Fordyce and Agrawal 2001), primarily due to the herbivore’s inability to penetrate the trichome-rich leaf surface, here we show that when these trichomes are removed from plants and embedded in an artificial diet making them a “no choice” diet, they slow down caterpillar growth. Non-glandular trichomes are usually stiffer than glandular trichomes, and in some cases are also mineralized with calcium oxalate or silica with possible anti-herbivore functions (Mustafa et al. 2017; Kariyat et al. 2017). In the current study, the glandular trichomes had a lesser effect on M. sexta mass when compared to non-glandular trichomes. However, that does not discount the fact that consumption of glandular trichomes also resulted in the reduction of caterpillar body mass, as observed during most of the measurements (Fig. 2). The preparation protocol used in the experiment could have effectively dissolved the non-volatile toxins in the glandular trichomes into the diet solution, and may have also volatilized other compounds present (Peiffer et al. 2009; Weinhold and Baldwin 2011). Therefore, any effect of glandular trichome diet could be more due these dissolved toxins, rather than the structural effect caused by non-glandular trichomes, an area we are currently investigating. Another explanation could be that the native structure and chemistry of glandular trichomes were totally alternated due to the applied separation and storage procedure. While the body mass data showed consistent and continued effects of trichome-containing diets, M. sexta mass gain over a period of time showed a different trend (Figs. 3, 4a). Except for the body mass gain at the second instar stage, only non-glandular trichomes-containing diet had significant effect. Interestingly, even for non-glandular trichomes-containing diet, the effect weaned off during later stages, and the caterpillars even had higher mass gain on trichome-containing diets (Fig. 4b). This is possibly because M. sexta is a voracious caterpillar that ingests massive amounts of food, especially in later feeding stages ̶ accelerated by longer feeding bouts and shorter gaps between them (Reynolds et al. 1986). In this case, we found that while the trichomes-containing diet affected mass gain of early caterpillar instars, these effects were minimized when caterpillars became older. While early instar caterpillars struggle to find an optimal location with low/no trichomes to commence feeding, late instars immediately feed regardless of the trichome density (Kariyat et al. 2017, 2018). More interestingly, these effects were very minimal on glandular trichome-containing diet, and were not significantly different from control diet. While we expected to see a reduced impact of glandular trichomes-containing diet on caterpillars growth, it is interesting that the glandular trichome-containing diet led to similar results as obtained for the control diet when fed by later instars reinforcing the fact that glandular trichomes contain toxins effective to early caterpillar stages (Peiffer et al. 2009; Weinhold and Baldwin 2011; Fig. 3b–g). Glandular secretions of trichomes have been found to be rich in ketones such as 2-undecanone and 2-tridecanone, which have been demonstrated to have insecticidal properties. However, while releasing toxins and affecting caterpillar feeding behavior, they did not impact caterpillar growth as a physical defense in our consumption assays, although under different circumstances, glandular trichomes can also act as a physical defense. However, it should be noted that the destructive separation of glandular trichomes in our experiment effectively removed the volatile components of glandular trichomes, a key component of their mode of chemical defense (Weinhold and Baldwin 2011), and we also did not estimate the expression levels of key genes in the plant defense pathways mediated by jasmonic acid, which is also triggered by damage of trichomes (Stintzi et al. 2001). Prolonged effects if any, caused by glandular trichome-containing diets can be possibly nullified by compensatory feeding (Ojeda-Avila et al. 2003), and so glandular trichomes, even with their toxins and metabolites is not always a major hurdle for M. sexta feeding (Wilkens et al. 1996). For example, Farrar and Kennedy (1987) found that 2-undecanone, a ketone found in wild tomato (Lycopersicon hirsutum Dunal, Solanaceae) glandular trichomes on the overall plant surface had no effect on M. sexta feeding, while causing deformity and mortality to the generalist herbivore Helicoverpa zea Boddie (Lepidoptera, Noctuidae), when it feeds on those glandular trichomes (Farrar and Kennedy 1987). In general, insect body size is determined by larval size at the time of pupation, which in turn is triggered by ecdysone secretion (Grunert et al. 2015). In M. sexta nutrient manipulation has been successfully shown to alter pupal mass (Nijhout et al. 2006), and in extreme nutrient limited conditions, M. sexta can also have supernumerary instars (Kingsolver et al. 2012). In our experiment, in addition to caterpillar body mass and mass gain we also found trichome-containing diet effects on pupation, i.e., on time to reach wandering stage, and body mass (Figs. 4, 5) at the time of wandering as our indices. Although we found continuous effects of feeding on diet containing non-glandular trichomes on caterpillar growth and mass in the early instars, most caterpillars successfully pupated (~ 5% larval mortality across treatments). And, while pupal mass was significantly lower after feeding on non-glandular trichome diet (Supplementary Fig. 1; Supplementary Table 1), neither pupation was restricted, nor larval instar was extend, suggesting that the physiological effects of trichomes-containing diets are possibly limited. However, delay in pupation can cause significant impact on M. sexta fitness, as it essentially allows more foraging time of predators on plants to locate the herbivores, before the latter fall off the plants to pupate in soil. We also found that the caterpillars, regardless of their age (early vs. late), showed no preference or aversion towards trichome-containing diets. However, there were significant differences between early and late instars on their movement—which we assessed with on/off data. Early instars preferred to stay on diet, and later instars were mostly wandering out of the pellet, independent of the diet treatment (Fig. 6). This reaction corresponds more to the instar-specific behavior and body size and than on any diet treatment effects. Using caterpillar-feeding assays and electron microscopy, we have previously demonstrated that trichome-mediated effects on M. sexta are both caterpillar instar- and trichome type-dependent (Kariyat et al. 2017, 2018). Here, we reinforce that results obtained from analysis of growth, choice, and development variables, clearly showing that trichomes, more specifically non-glandular trichome-containing diets have significant and sustained negative effects on M. sexta caterpillars. To conclude, this study reinforces the fact that trichomes are an important herbivore defense, and when separated from other plant defense traits, can lead to negative effects on growth and development in caterpillars. Future studies should examine the ramifications of different types of trichomes across multiple plant families and herbivore species to understand the intricacies and variation of such effects with possible implications for pest management. We thank Evy Solis and Jasleen Kaur (UTRGV, Edinburg, Texas, USA) for their help with trichomes extraction in the preliminary study. This work was funded by University of Texas System Rising STAR Award, UTRGV Startup Funds, and UTRGV College of Sciences Seed Grant, and UTRGV High Scholars Program.